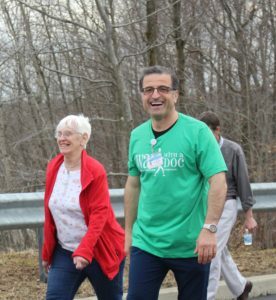 Walking is good for your brain, heart, body and spirit, professed Dr. Hassan Khalil on Monday afternoon, just before he led around 40 people in the inaugural Walk with a Doc at Endless Mountains Health Systems in Bridgewater Twp. The focus of the first local walk was bone health, and Dr. Khalil said walking helps to make bones stronger and builds overall strength. In addition to those benefits, taking a walk outside also exposes a person to natural Vitamin D provided by the sun. Vitamin D helps bodies absorb calcium, essential to bone health. Prior to the group stepping off, Dr. Khalil spoke about the importance of bone health as a person ages, and pointed to the large number of people that enter a nursing home after sustaining a broken bone or hip in a fall. “Walking makes the bones stronger,” he said. “Everybody should walk and integrate it into their daily living,” the doctor offered. He also suggested finding a walking partner to make it more fun. Carol Pierson, of Brooklyn Twp., joined the group of walkers. She is taking a nutrition class offered at EMHS and the walk was mentioned there. 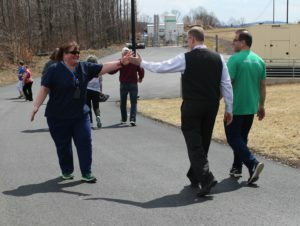 “I figured if I was going to do this, I was going to do it all the way,” she said referring to her overall goal to improve her personal wellness as she walked the laps in the parking lots that surround EMHS. Barb and Tim Wyams, of Montrose, also participated. The couple already walks about three miles each day. “This gives us a chance to add another dimension to our walks,” Tim said. The Wyams take several walks each day, so not all of their three miles are logged at once. “We’ve slowed down some,” he said, explaining he used to do triathlons and was a runner. Dr. Khalil (far right) walks with EMHS CEO Loren Stone who received a high-five from Christine Gursky. EMHS CEO Loren Stone said the Walk with a Doc is a worldwide program, with around 500 participating sites. The program was started in 2005 in Columbus, Ohio, by Dr. David Sabgir, a cardiologist that became frustrated with his inability to affect a change in his patients’ behavior through just seeing them in an office setting. Dr. Sabgir invited patients to walk with him in park and over 100 people showed up that first day. Since then, the grassroots effort has grown to include over 500 chapters. Geisinger Health Plan has partnered with EMHS for its Walk with a Doc program as a sponsor, Stone said. Representatives from Geisinger manned a table, with a model of a bone – one side depicting a healthy bone and the other side showing a bone with osteoporosis. They also provided water and apples to participants following the walk. The program is an effort by EMHS to bolster overall community wellness, in addition to providing medical care. Stone said plans to bring the Walk with a Doc program to the area began prior to the launch of the state’s Rural Health Model, but it is one of the things EMHS has added as a public health initiative. 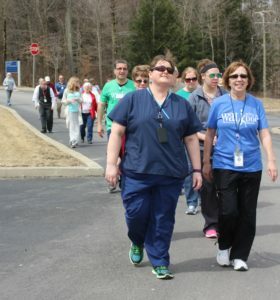 The next Walk with a Doc event will be held Wednesday, May 8, 1-2 p.m., and will be led by Dr. Joseph Speicher. The topic for the May walk is diet and cholesterol. Participation is free. For information on the national, non-profit organization, visit www.walkwithadoc.org. Be the first to comment on "Walking to wellness"